By today's standards, the computers of the 1980s were small, slow, and not very powerful. 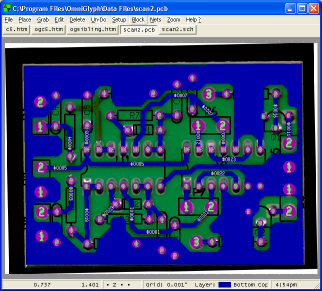 Consequently a great deal of finesse was needed to achieve the necessary functionality to handle the relatively large data set required by a program such as a PCB editor. In the day, CIRCAD was written entirely in Assembler Language (over a third of a million lines of code), and the program itself was segmented into a series of overlays to minimize its footprint in the tiny 640KB of system memory. Over the years, computers have grown in capacity several hundred times that of the original DOS machines, and CIRCAD has grown along with them. Currently, CIRCAD is embedded within a larger and more complete program called OmniGlyph, where it shares a common database with an integrated pixel image processor and an ASCII text processor. Seven different "skins" are applied, one for each of Schematic, PCB, Drawing, GIS, Pixel Array, Astro-imaging, and ASCII text data files. OmniGlyph maintains the ease of use and user friendly feel of CIRCAD'98 and its predecessor, DOS CIRCAD. Taking advantage of the large and computationally fast machines available today, OmniGlyph leverages the power of additional memory to create a richer data structure that provides greater functionality with integration of features and parameters. A Powerful Editor The ability to have multiple editing windows simultaneously operating upon a single set of data files provides a degree of functionality unmatched in the world of modern computing. Signals highlighted on a schematic sheet in one window are immediately highlighted on the corresponding PCB file in a sibling window. Specific text files (such as a netlist error log) are integrated as well. Simply positioning the cursor over the top of an item in the error log will immediately highlight the affected items in the corresponding PCB file. 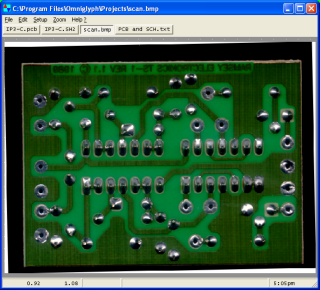 A Tool for Reverse Engineering With pixel images integrated into PCB data files, reverse engineering a circuit becomes as simple as placing actual parts and tracks on top of the pictures of the parts and the tracks. An assortment of pixel image processing functions are available to rotate, scale, and transform the images so they are properly grid-aligned with the real world. 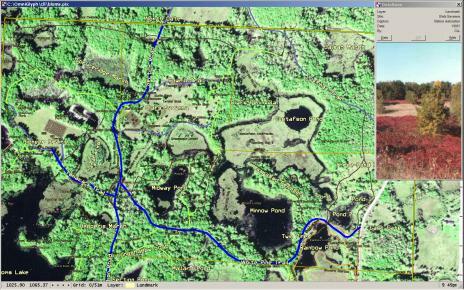 Once the new layout is complete, the superfluous image data can be discarded. 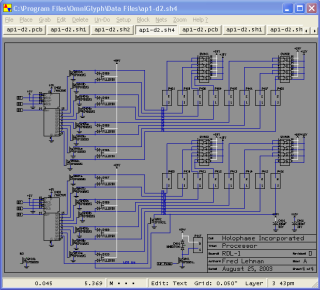 A netlist of the actual connections can be created and a schematic data file can be produced. There is even an autorouter specifically designed for schematics. 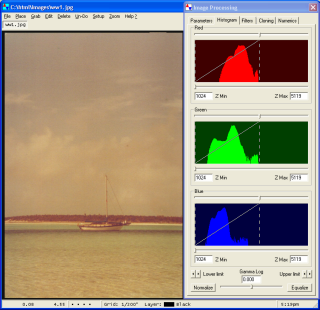 A Photo Processing Workshop If you are in need of reprocessing old photographs (not associated with PCB data files), OmniGlyph's picture editor is unrivaled in terms of power and ease of use. In this example, an old photograph (from the early 1980s) that has faded quite badly has been completely recovered, quite literally with the click of a single button. A full set of photo-processing functions are available for specialized needs such as the repairing of damaged areas, the enhancement of coloration, or the adjustment of sharpness. 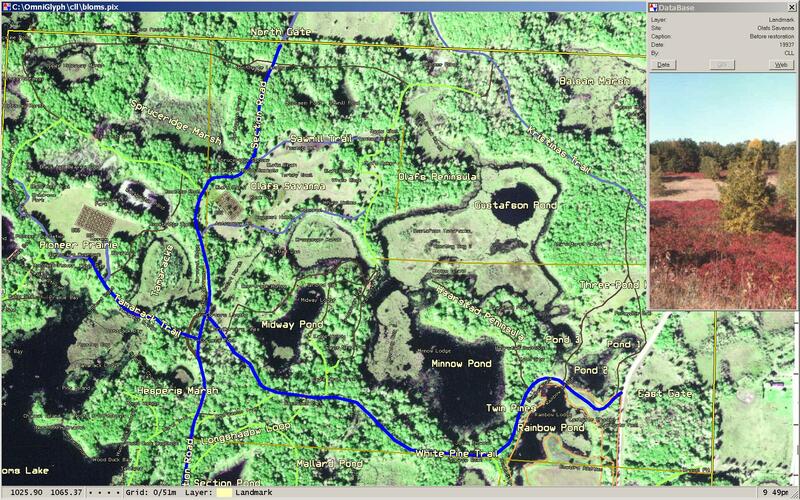 A Geographic Information System CC-GIS is a powerful Geographic Information System that ties together satellite imagery, graphical display objects, and information databases. In the example at the right, the backdrop is a high-resolution aerial photo that has been overlain with an assortment of named targets. When the cursor is positioned above any of the target objects, key parameters are extracted from the object and are used to access a set of data bases. The resulting data are displayed in a pop-up box (shown here on the far right). In addition to simple parameters, the d-base may identify a picture to be displayed or a web site to be accessed with a browser. 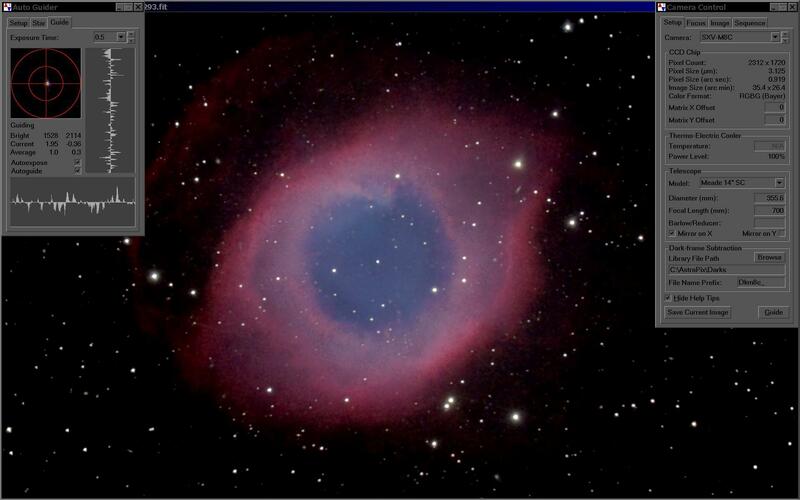 Astro Imaging at it Best AstroPix is yet another of OmniGlyph's several faces. The example shown here is an actual screen snapshot taken during a nighttime astronomy outing deep in the Florida Everglades. AstroPix is running two cameras, one for imaging and the other for autoguiding the telescope to minimize tracking errors as the stars arc across the night sky. The object being photographed is NGC7293, the Helix Nebula. The menus and dialog boxes have been subdued by the application of a "dark-sky" theme. 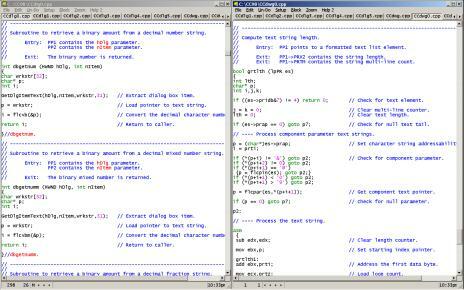 An Integrated Text Editor OmniGlyph's integrated text editor was written first, and was then used to create the remainder of the program code. 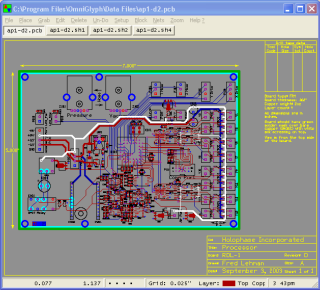 It is first and foremost a code editor, but is serves well as an interactive text processor for PCB and Schematic files. 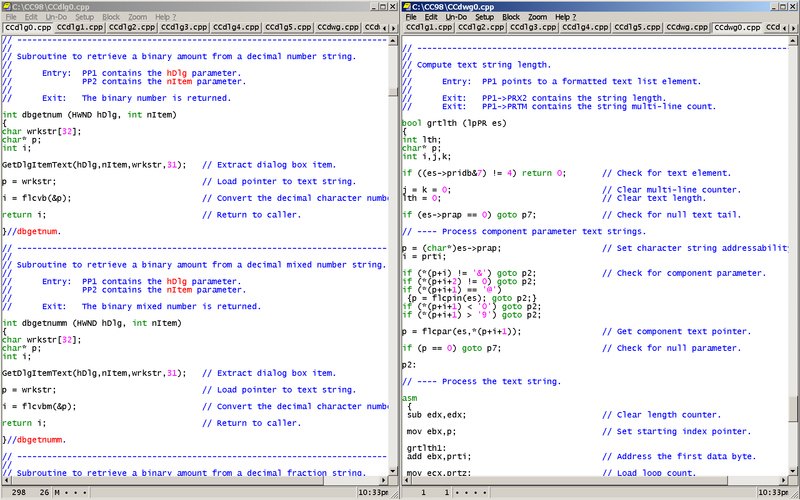 Many innovative features are available to the programmer writing in Assembler, C++, VHDL, or HTML. Some, such as interactive file comparison and HTML image mapping, are found nowhere else.